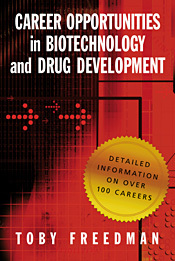 Source: Toby Beth Freedman, Ph.D.
Career Opportunities in Biotechnology and Drug Development (By Toby Freedman 2008, 409 pp., illus., index, Paperback $39, ISBN 978-087969880-5) provides a comprehensive and systematic overview of careers in the life science industry, with all their ups and downs. The author, Toby Freedman, Ph.D., has conducted interviews with over 200 of the key players in the industry, who provide first–hand explanations of their day–to–day roles and responsibilities, and offer key insights into how they landed those jobs in the first place. Careers in everything from discovery research to venture capital are covered in detail.